It’s a good sign when viewers leave an advanced screening of a forthcoming film, pumping their fists, applauding, and smiling – it’s the kind of response that the first Rocky movie inspired and fitting that the classic film’s heir, the Creed, invites similar. In 2013, Ryan Coogler’s Fruitvale announced the arrival of a promising young director. Coogler’s sophomore effort, confirms him as a sensitive and skilled filmmaker. Under his capable direction, Rocky and Sylvester Stallone get a touching nod and a new millennial chapter, and we get further introduction to several rising stars in Coogler, Michael B. Jordan (Adonis Creed), and Tessa Thompson (Bianca). The millennial treatment of Rocky is significant. The first film (1976) and the sequels ​('79, '82, '85) played overtly on some specific racial and national politics. The 1976 script – a compelling story read – finds dramatic fuel in the racialized history of US Heavyweight boxing. Apollo Creed, the undefeated champ who picks Rocky, “The Italian Stallion,” out of oblivion for a bicentennial match when the real contender is injured, understands the racial mythology underlining a “Great White Hope” in the most sacred division in boxing – the heavyweight. Historically, amid the legacy of Jim Crow America, a boxing match between a black and white opponent was a space where the racial status quo and ideologies of racialized masculine superiority and potency were, perpetuated, countered or challenged. Of course, Stallone gives even further authenticity to his tale because real life legendary Italian boxers like Marciano are Rocky’s heroes. In the later Rocky ​films, Stallone taps further into the not so far in the past Cold War politics so that the​ black and white boxers (Apollo and Rocky), having earlier ​prove​n​ their masculine equality to each other in the ring, and Rocky cemented as a ‘true’ American ‘Great White Hope,’ are united in friendship and national identity against common foes​, including lastly a​ national ‘other’ – the​ Russian boxer Drago who kills Apollo​. Creed proves refreshing in not attempting to be​ a contemporary redo of Rocky [though yeah it does tease those national politics and retains all the usual testosterone]. 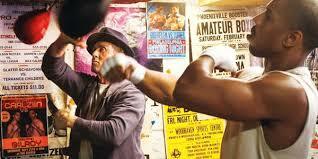 Some of the best elements in Creed – Sly Stallone’s perfectly pitched performance as elder Philly legend and reluctant coach-mentor, “UNC” to Jordan’s young Creed and the unfolding relationship between the two, the nostalgic nods [not too much though] to iconic scenes from the original Rocky, the boxing world recreation with HBO’s team, the appearance of boxing star (Andre Ward) and no spoiler alert necessary cause you know it’s there – an exquisitely choreographed, knock down, championship fight, plus two arresting, capable female co-stars in veteran actress Phylicia Rashad, young Creed’s surrogate mother and step-mom and Thompson - reasons enough to enjoy the film. Creed’s missteps are few. The story needs a bit more backstory behind Creed’s drive to fight despite the privileged life Apollo’s widow provides and his outright desire to deny and escape his father’s long shadow and misses a good opportunity to enrich the story by doing the same for Adonis’s love interest, the intriguing Bianca. Part of the formula of every aspiring boxing champ story on the big screen is the lady love, a do or die sort of chick who loves the champ winning or losing. Who can imagine Rocky without Adrien in that first Rocky film? Thompson’s Philly girl Bianca, an inspiring singer, is pleasantly allowed to be a tad more than an appendage to Adonis; she’s got big dreams and ambitions and a physical opponent of her own to triumph over, but she remains something of an enigma. Co-written by Coogler and Aaron Covington, Creed showcases Coogler’s savvy use of mise en scène and highlights several developing stylistic trademarks from his use of blurred shots to his ability to make the setting an integral secondary character pivotal to the storytelling as he does with the gritty scenes of Philadelphia in Creed. He smartly mixes the old with newer notes, both visually and orally, for example, Rocky’s unforgettable anthem sampled on rapper Future’s, “Last Breath” and a Tupac cut serving as Creed’s ring entry. Yet, the most outstanding feature of Coogler’s work thus far has been the distinctive treatment of hip hop culture bred young black men whom he humanizes more adroitly than we usually see on the big screen. He imbues the representation of black male identity with emotional complexity and vulnerability one of the winning aspects of the Coogler - Michael B. Jordan collaboration. We are witnessing some magic here in their cinematic partnership and may well be evolving into one of those iconic director-actor relationships [think Spike Lee and Denzel Washington, DiCaprio and Scorsese]. There is much to cheer about Creed from Sly Stallone and the triumphant rebirth of Rocky in a story that can stand on its own but weaves nicely together wit the classic film’s legacy to Michael B. Jordan, a bonafide leading man, and finally Coogler who delivers a feel good, must-see cinematic punch right in time for the holidays.